Familiar as the site of the WTA Mercury Insurance Open each summer, La Costa Resort & Spa has a long tradition of caring about tennis and of pampering the guests of its spa. But this is a far different La Costa than the one I first visited back in the 1980s. Over the last several years, more than $50 million to upgrade the resort, including renovations of the rooms, upgrades to the golf course, and a new adult swimming pool. Its architecture reflects the state's Spanish Colonial history—all white stucco, wrought iron, red tile, and open plazas. A handsome Feng Shui-aligned spa and adjacent Chopra Center for Ayurvedic treatments anchor one end of the main plaza, with restaurants scattered throughout, some with outdoor seating. The tennis club has four red clay and 13 hard courts, one of the latter a sunken stadium with seating for 1,000. It is managed by Cliff Drysdale Tennis, who installed Bryce Cunningham as director. 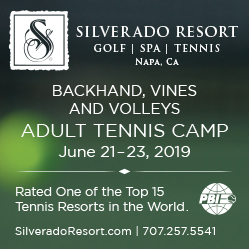 A certified USPTA elite professional coach and Tennis Australia professional coach, he had previously run camps and programs at The Ritz-Carlton Key Biscayne and directed the Bluewater Bay Tennis Center, Niceville, both in Florida. At La Costa, he and his staff of nine pros has beefed up the program to include not only private lessons but also thrice daily 3.0/Intermediate clinics supplemented by sessions for beginners and workouts for intermediate/advanced players. He also added twice weekly Cardio tennis to the mix and after-school programs for various ages of juniors. during July, the San Diego Aviators host their home World Team Tennis at la Costa. Courts & Fees. The resort has 13 hard courts—one of them a stadium—and 4 red clay courts (7 with lights) arrayed below an attractive clubhouse containing an expansive, apparel-stocked pro shop. Court fees: $25/hour on hard courts, $35/hour on clay. Director of tennis Bryce Cunningham and the Cliff Drysdale Tennis staff stage this ladies-only retreat at the Omni La Costa Resort & Spa in Carlsbad, north of San Diego, CA. The 5-day event bundles drills and match play with lodging and meals. For more information, visit Ladies Retreat by Cliff Drysdale Tennis or phone: 830-625-5911, ext 208 or email: . La Costa offers both rooms and suites. Rates do not include taxes, parking, or a $20/day resort fee.